The Pantry Garden has been built! We have three raised beds and one rototilled bed thanks to a generous grant from Berkshire Bank and the hard labor of our fantastic volunteers. 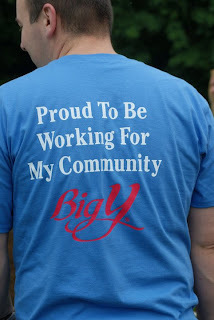 Special thanks go out to our volunteers from Big Y; Mark Magni, Amy Charland, Chris Howe and Wayne Wasilefsy, as well as our resident garden experts; Sally Andrade and Joan Presz. Our efforts have also been kindly supported by the employees of Meadowview Farms, and Southwick residents; Freda Brown, Jocelyn Linnekin, and Joan Presz, who all donated plants to the garden. We look forward to offering tomatoes, peppers, cucumbers and more fresh vegetables at Our Community Food Pantry throughout the summer, as a means of supplementing the canned goods we provide as staples. We also look forward to planting fall crops in late summer. We're so grateful for our wonderful volunteers! 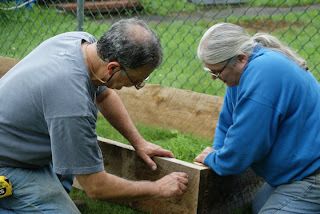 Check back soon for the latest updates on the garden's progress!